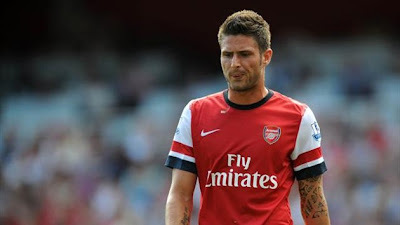 Naija End Gooner: Preview Southampton | Giroud's Duck Breaking Day? It's match day at last and am I glad it is? After a two week international break I have developed all the withdrawal symptoms of a junkie -anxiety, dilated pupils, agitation, goose bumps, sweating, yawning. Have to seriously start considering rehab. Our opponents today is Southampton FC, the team that gave us Walcott and The Ox. Southampton was relegated to the Championship in 2005 after playing in the top flight for 27 consecutive years. In 2009 they were again relegated to League 1. That seemed to be the spur they needed to knuckle down as they gained back-to-back promotion to find themselves back in the Premiership after spending one year in the third tier of English football guided by their new manager, Nigel Adkins. They are back and they've played three games and lost all. The only team in the Premiership without a point to its name. They will be back in the Championship this time next year if they don't pull that rabbit out of the hat that earned them back-to-back promotion. Of their three games so far this season, I saw only the one against United which they lost 3-2 in the last 10 minutes after leading 2-1 up till then. They showed a lot of mettle as they attacked United without fear but ran out of steam towards the end, allowing Van Persie to score two goals in quick succession to complete his hat trick after missing a penalty earlier in the second half. Against City at home in their first game of the season, they also lost 3-2 after leading the game 2-1 until the 78th minute when Dzeko leveled the scores. They also went down to Wigan at home 0-2 in their second game of the season. Two goals against United and City respectively shows that they are capable of scoring against the best and should not be taken lightly. But today is not the day they start their much needed revival. They are up against the Arsenal. Team news wise, there's mostly good news. Sczezney is back from his injury layoff and should be back between the uprights in place of Mannone who has deputized brilliantly for the past two games, keeping two consecutive clean sheets. Let's hope Sczezney can continue this trend as we remain the only Premiership side that's yet to concede a goal which has earned our defense plaudits in an area that we have been found lacking for a while now. Kos is back as well from injury as well and he was last season's first choice pairing with Vermaleen. Kos was an unused substitute for the French team in the two games they played during the international break. His return should cause a bit of headache for Wenger as he'll ponder on changing a center back pairing that has not conceded a goal in three games. Per has done well in his absence as Vermaleen's center back partner but my guess (and preference) is that Wenger will return Kos to partner with Vermaleen because of Per's legendary slow pace which has caused a couple of heart-stopping moments in the three games he has started so far. Kos will certainly be in today's squad even if it's as a sub. Theo will face a late fitness test this morning after being excluded from the England squad against Ukraine last Tuesday due to a virus. I expect he'll start from the bench as has been the case so far this season even if he's declared fit which means The Ox will start in the right side of attack. His pace will come in handy in the second half when Southampton would have tired out as they've shown they're prone to in their last three games. The notable absence from today's game is Diaby who returned from international duty with what has been described as a minor injury. Wenger indicated in Thursday's press conference that he will not gamble with him considering his injury history. This is the right decision bearing in mind we have Montpellier in the Champions League next Tuesday with City following afterwards next Sunday. These are crucial ties and with due respect to Southampton, I think we can go into today's battle without needing to risk Diaby. Ramsey or Coquelin will be expected to slot into Diaby's place and though I'm not a big fan of Ramsey's I'll prefer him to Coquelin because of his experience. Coquelin has shown a lot of promise but exuberance tends to get the better of him too often. Will prefer he's given a run-out in the second half if need be. Arteta of course will be expected to play in that hole in front of the back four where he has done such a magnificent job since Song's exit necessitated his being deployed in the defensive mid-field role. Cazorla is fit as a fiddle. After netting his first for the club against Liverpool before the break, he'll be looking to add to that today. I expect Poldi and Giroud to retain their positions in the starting line-up with Poldi starting in the wide left while Giroud mans the center-forward position. Poldi scored his first against Liverpool before the break and will surely be looking to add to that. Giroud didn't have such a good time on international duty for France as he was booed off the field by his own fans in France's 3-1 win against Belarus. He surely will be needing a confidence boost and a goal against Southampton to open his account is what the doctor has ordered. So my predicted starting eleven is Szezney, Jenkinson, Koscielney, Vermaleen, Gibbs, Arteta, Cazorla, Ramsey, Ox, Poldi, Giroud. With Theo, Per, Gervinho, Coquelin, Santos and Mannone starting from the bench. Southampton has shown they should not be taken lightly even if their results so far do not reflect that so I hope we accord them the same respect we did Liverpool, Stoke and Sunderland so far. Unlike Stoke and Sunderland, they are a team that has shown they like to play football and will play football no matter the opponent which means the game should be an open one. This kind of game usually suits us and I predict a win for us. I hope our defense continues the clean sheet trend since this will do a lot for the confidence of the team as a whole going forward. 3pm today at the Emirates, it's Arsenal against Southampton. Let's go, Gooners! Honestly I'll take a 1 nil win today just to keep that clean slate going. mini mini myni mor. Arsenal Win! Yippeeeeeee! May be Wenger should start Giroud from the bench. That will take the pressure off him. Who starts in his place? Oh no! Chamakh! The old question of depth in-squad arises again. Damn! You got your wish about Giroud, bro. but still no goal despite the lack of pressure when he came on today. Good display today. that free kick from Podolski was so good to see.